Hanit Benbassat is passionate children's book author, and mother, known for her uplifting, lovable spirit. Children really are what her life is all about (her family, vacation, aspirations). Hanit was a shy, introverted child until the age of fifteen when she learned to use her inner powers of hope and self-love to become the person she wanted to be. Knowing that it is important to empower children to tune into their heart, Hanit set out to help little ones fulfill their greatest potential. Hanit was born in Israel and now lives in Orlando, Florida, with her three brilliant children and entrepreneur husband. She is a good hiker, amazing cook, and a great gardener. In her spare time, she also enjoys reading, exercising, hiking, visiting beautiful places around the world, meditating, connecting with crystals, and spending time with friends and family. For more information about Hanit Benbassat’s books and products you are invited to visit her website: www.hanitbenbassat.com. Jake's Quest For The Five Stones: An Adventure Guide to Crystals by Hanit Benbassat is a marvelously written story that begins in the Elven village of Keeponia. War has erupted between the elves and the goblins of Nordia. The goblins' artisans are jealous because their customers won't come to their village, and so they purchase their wares at the market in Keeponia. Out of jealousy, they want to take the Elven village by force. Jake's father and brothers are chastising him for not joining in on the war effort. Jake's heart is set on trying to find a peaceful solution to end the war. Jake is approached by one of the village Elders who sends him on a quest to retrieve "a reserved secret power, super snowflake flower." The elder tells Jake that it has secret powers that can help him and his friends. He was told that many elves that had gone before him had failed to retrieve it, and never returned. Out of desperation, Jake begins his journey to the top of Nindero Mountain to retrieve the solution to ending the war. Hanit Benbassat has created a masterpiece in the form of a children's tale, filled with a blend of mythical creatures, and expert story telling. She is able to capture the emotions involved in war, and with the usurpers wanting to take what isn't theirs for their own. Hanit's characters are very real and easy to identify with. Ms. Benbassat is able to weave the properties of certain crystals in a fantasy setting that is sure to reach children on all levels of discovery, such as how your emotions can affect your way of embracing your inner joys, and enlightenment. Jake's Quest For The Five Stones also has a cleverly inserted adventure guide to crystals, and their properties that help in healing and repairing one's self esteem. The author brings the philosophy of what Dale Carnegie introduced roughly a century ago. The illustrations by Petro really helped to capture the wonder of this adventure. When I was finished reading this moving tale, all I could say was, wow! Well done! Jake’s Quest For The Five Stones: An Adventure Guide To Crystals is a coming of age adventure fantasy novel for children, grades 4-6, written and illustrated by Hanit Benbassat. The villages of Keeponia and Nordia were at war, and Jake didn’t want anything to do with it. He couldn’t understand why the elven inhabitants of Keeponia and the goblins of Nordia were unable to peacefully resolve their issues. The goblins’ environment was much harsher than that of the elves, whose own town was blessed with sunny and temperate climes all year round. Nordia was generally a dark and cold place with summer only a brief respite two months in length. While peaceful coexistence flourished between the two towns and their inhabitants, the goblins would bring their wares to the elves’ very successful market, but the desire for power evinced by some elder goblins led them to try to take over Keeponia. The elves responded with equal ferocity in defense of their village. Jake’s brothers had all joined in to fight the goblins, and Lorsan, their father, was infuriated by Jake’s refusal to participate. Soon, all the townspeople treated Jake with the derision and disdain evinced by Lorsan for his different son. Only Jake’s mom understood. Jake knew there had to be a better solution, but finding it would take soul-searching and courage. Jake took his leave of his mom and Keeponia, and set out to discover his answers. 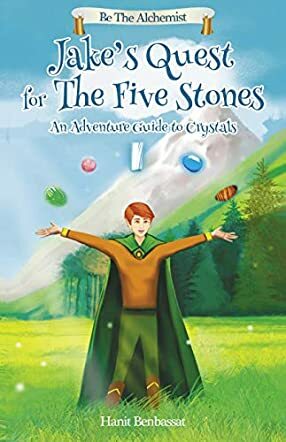 Jake’s Quest For The Five Stones: An Adventure Guide To Crystals introduces readers to crystals and minerals and their powers as they follow along with Jake on his quest of a lifetime. I’m a big fan of coming of age books, and enjoyed seeing how Jake’s experiences and eventual mastery over his own fears and uncertainties help him find his purpose. Benbassat includes animal guides who help Jake find his path as well as the five stones, giving this New Age adventure fantasy an added dimension. Her inclusion of the History of the Stones, How to Connect with Them and her section on Animal Guides at the back of the book is a marvelous send-off for readers who’d like to learn more about the elements that make Jake’s quest a success. Jake’s Quest For The Five Stones: An Adventure Guide To Crystals is highly recommended. Jake’s Quest For The Five Stone: An Adventure Guide to Crystals by Hanit Benbassat is an exciting, fast-paced adventure quest for young readers that contains several important messages. The elven village of Keeponia was constantly at war with the goblin village of Nordia. Keeponia was set in beautiful surroundings while Nordia was cold and not as nice. The elves’ market was very successful while the goblins’ market was not. What was the elves’ secret, they wondered? Why not take what the elves had? The war began. But the elves fought back and trained the young elves to fight. It seemed that war was here to stay. Jake didn’t like the idea of war. He felt there must be a way to resolve the animosity between the elves and the goblins. He’d joined in the fight once, against all he believed in, and hated himself for it. His stance angered his father, Lorsan, and his brothers. Finally, Jake was forced to leave the family home and live alone. The other elves ignored him and soon Jake was completely ostracized. Only his mother supported his ideas and helped him, but Jake also felt she did not fully understand his ideals. One day Jake met one of the elder elves, a rare privilege indeed, and Monuli directed him to find the answers he sought at the very top of the Nindero Mountain. He would find a special power in a snowdrop flower. Many had tried and failed. Can Jake succeed? Hanit Benbassat has created a wonderful meditation style story for youngsters in Jake’s adventure quest. Of course, the quest is an inner experience as much as it is an outer one, and the author merges the two aspects together seamlessly as Jake finds five stones to help him and meets various animals who guide him. The descriptions are absolutely beautiful, and the stunning and brightly colored illustrations will help young readers to visualize Jake’s environment and what surrounds him, both serene and frightening experiences. The properties of the five crystals that Jake finds are carefully woven into Jake’s emotional development and the growth of his self-knowledge and understanding. The fact that this quest is not easy also helps youngsters to understand that life’s path is not easy. There will be challenges and hindrances along the way. Maybe, like Jake, they will even want to give up. But we learn from everything that happens, even the bad experiences, and everything builds towards creating a whole, well-rounded person. Young readers will enjoy themes of courage, being grateful, helping others, trusting oneself, sticking to one’s beliefs no matter how hard it is, and always finding a peaceful resolution to conflict. The end of the book has a special treat for young readers in a Guide to Crystals and a section on Animal Guides, and what the animals represent in Jake’s story. This is a lovely fantasy/fable story that offers many discussion points for both teachers and parents to use while reading with children.